Evelyn Peters Kyle later wrote a history of early Pasadena. Evelyn Peters achieved this dreamy look with lots of affordable netting, in both the veil and dress. 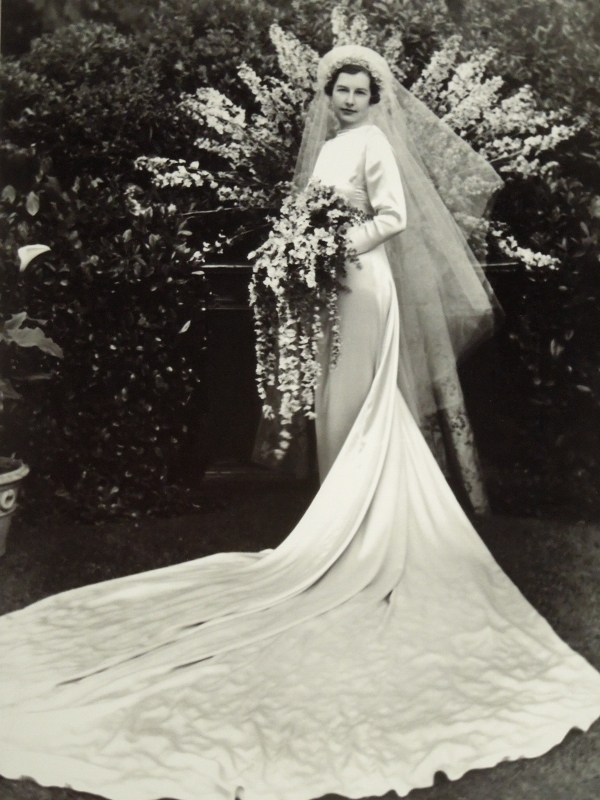 Other brides wore the wedding dress their mother, grandmother or other relative had worn. Such a dress had great sentimental value, and the price was right. Julia Hills Whitney, 1991 and Jean Eastwood Collins, 1939. 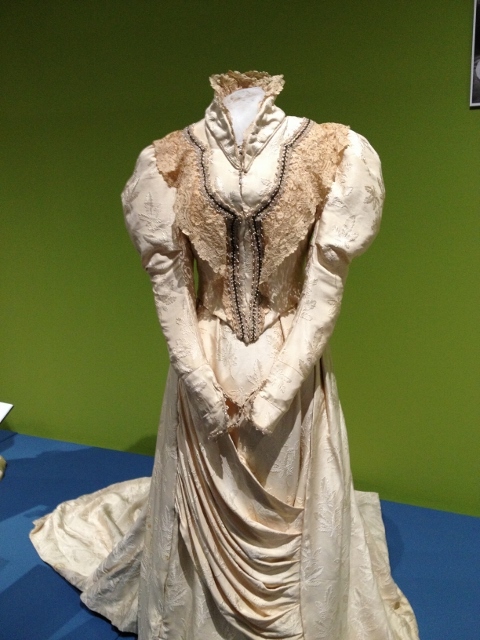 This classic 1890s dress has leg-of-mutton sleeves. It was worn again in 1939. 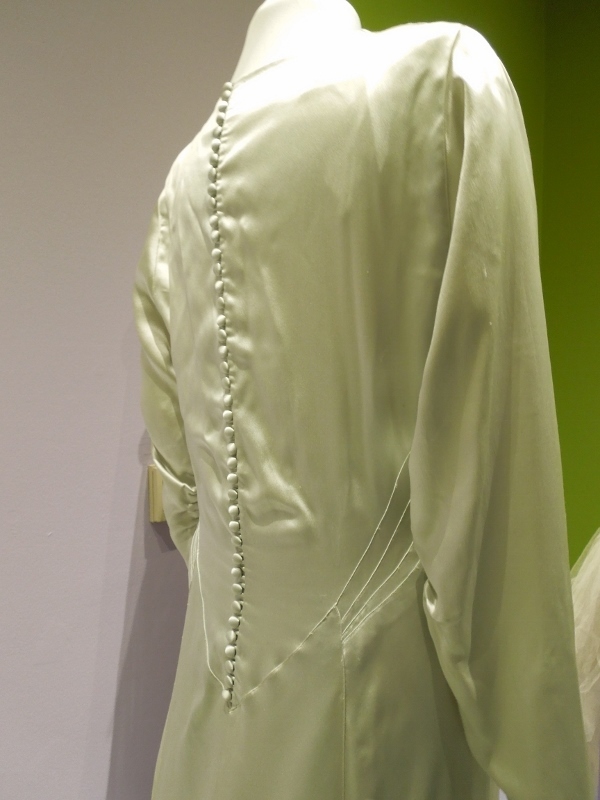 Around 1930, designers began to cut silk on the bias (on the diagonal, rather than along the horizontal and vertical threads in the woven cloth). The bias cut gave a little stretch and a beautiful drape, so dresses became slinky and hugged a woman’s curves. Women were interested in what celebrities were wearing. Actress Jean Harlow is still famous for her dress in “Dinner at Eight.” Wallis Simpson married the former king of Great Britain in a bias-cut gown of blue silk. 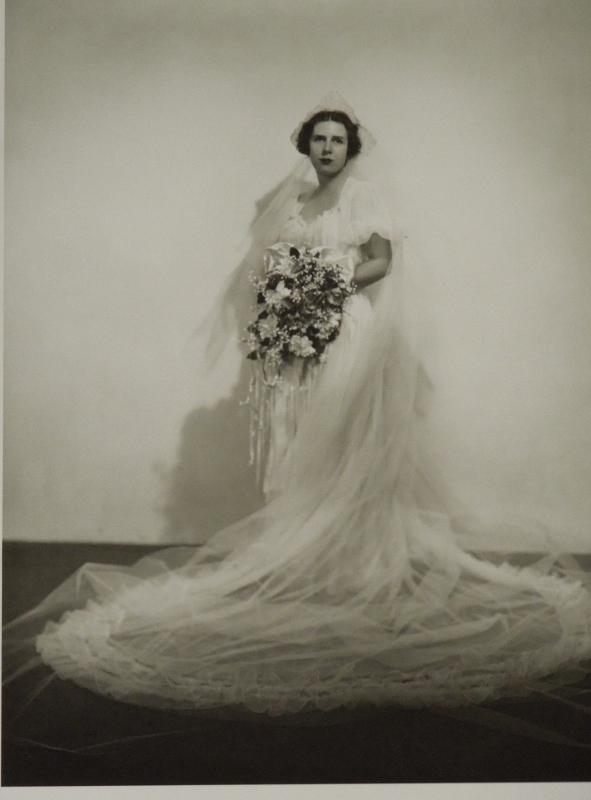 Wilma Maguire married in a reproduction of a royal bride’s gown, Princess Marina of Greece and Denmark, who married Prince George, Duke of Kent, in 1934. 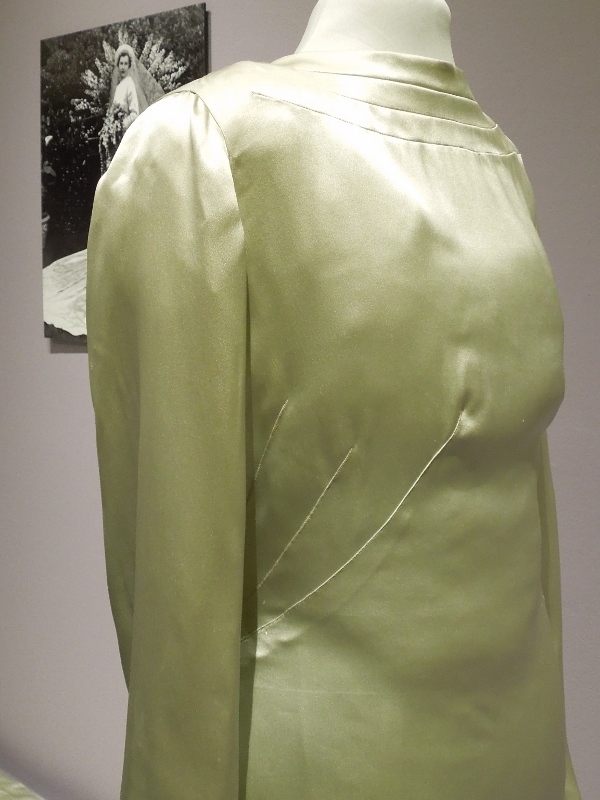 Wilma Maguire’s train attaches at the shoulders and ends with a fishtail hem. Barbara Cheesewright, the daughter of a well-known interior designer, apparently loved color. 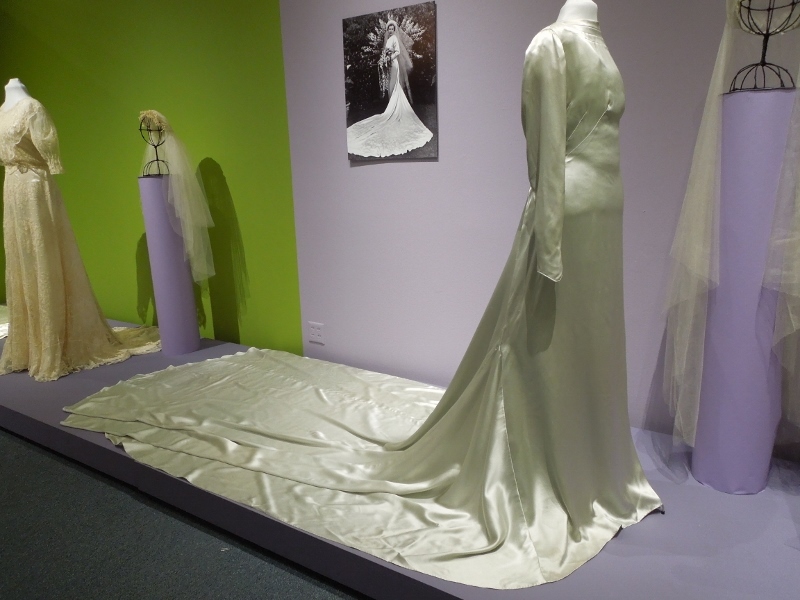 Her wedding gown is aqua in natural light (but mint green in the exhibit gallery, which has colored walls). She chose the same color for her veil and headpiece, at left above. Under the brim of the headpiece, she placed delphiniums, which are often blue. I am not sure they were blue flowers, but I like to picture them that way, complementing her aqua dress. 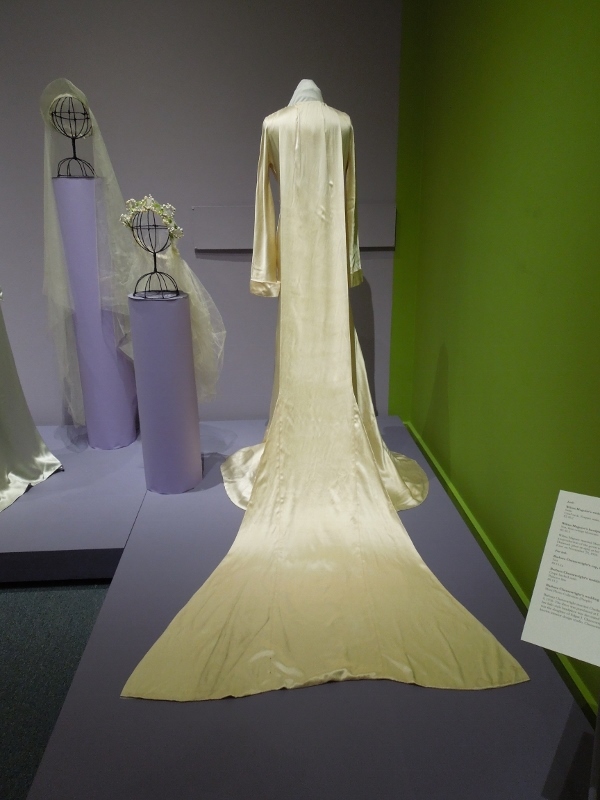 Barbara’s 1936 gown has a six-foot train. 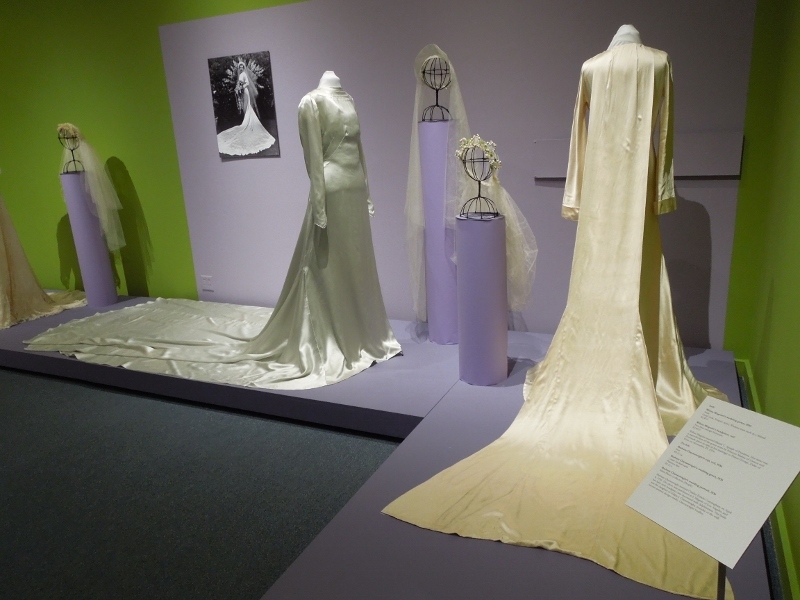 I thought you might like to see this: a recent Australian exhibit of wedding dresses. The gowns here are just beautiful, and I love how you have matched some dresses with a picture of the bride. Thanks for popping by my little corner of the world and leaving your lovely comments.